Todd Peck picked up the 1st last-place finish of his NASCAR Camping World Series career in Saturday’s Active Pest Control 200 at the Atlanta Motor Speedway when his unsponsored #83 Chevrolet overheated after 2 of 130 laps. 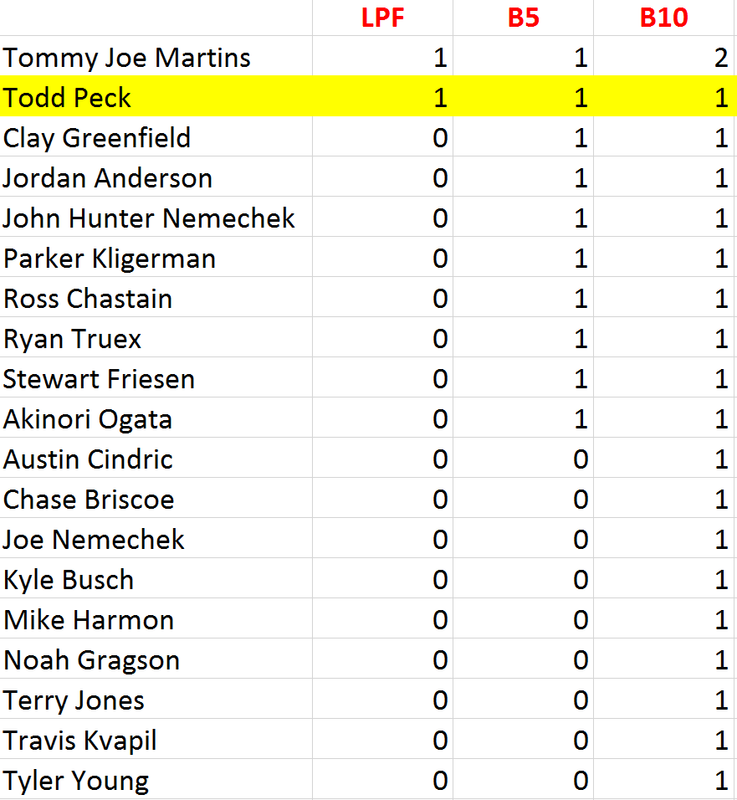 The finish came in Peck’s 22nd series start. Peck entered this, his seventh season of Truck Series competition, by tying his career-best finish of 18th in the crash-filled Daytona opener, matching his run at Phoenix in 2012. 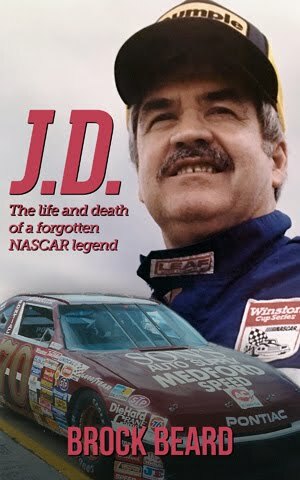 It was in Trucks that the second-generation driver made his debut in NASCAR’s top three divisions, driving a #96 Chevrolet owned by his father, Dr. Michael Peck. 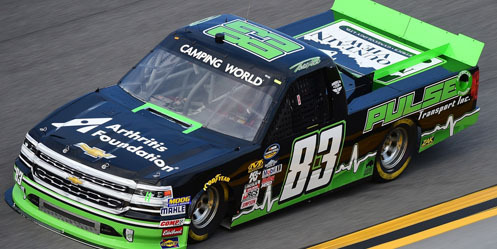 As with the truck he raced that day, the #83 he drove last week at Daytona carried decals for the National Arthritis Foundation, an affliction the younger Peck has dealt with since youth. Peck now drives for a start-up team owned by D.J. Copp. Copp, a veteran tire carrier and crew chief with over 17 years of experience, developed his own pit crew training facility, OTWcrew.com and was a popular segment commentator for ESPN. This past offseason, Copp acquired assets from Contreras Motorsports, a team owned by former Truck Series driver Carlos Contreras, and fields what were once the team’s #71 Chevrolets. Contreras’ effort allowed Copp’s #83 to lock itself in on Owner Points, setting up Peck’s career-best run. 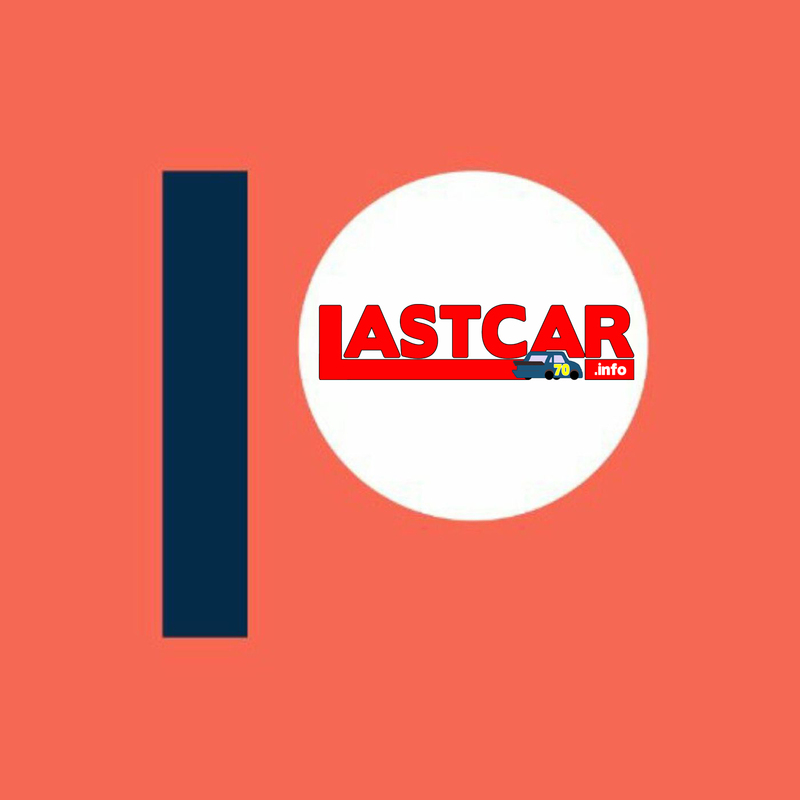 Peck and Copp arrived at Atlanta as one of 34 entries on the preliminary entry list, one which grew by one following the addition of Tracy Lowe’s #1 Chevrolet with Mike Harmon aboard. Harmon vacated the #12 Lucas Oil / Knight Fire Protection Chevrolet fielded by Rick Ware Racing, giving Jordan Anderson the spot. While both Harmon and Anderson qualified for the race (Harmon having recovered from a spin in qualifying), three drivers were sent home: J.J. Yeley in the #63 Chevrolet for Mike Mittler’s MB Motorsports, as well as owner-drivers Norm Benning in the #6 Houston Roll Pipe Chevrolet and Jennifer Jo Cobb in the #10 Driven2Honor.org Chevrolet. 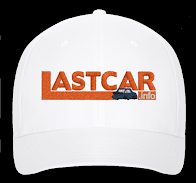 For Benning and Cobb, Atlanta marked their second-straight DNQ. In addition, Austin Wayne Self, who along with Yeley earned Top 10 finishes at Daytona, withdrew his #22 AM Technical Solutions Toyota. Peck, meanwhile, skipped the opening practice, ran the slowest lap overall in the second session, climbed to 31st of 34 in Happy Hour, and again fell back on Owner Points, securing 29th in qualifying with a lap of 171.164mph. Starting 32nd and last on Saturday was Akinori Ogata, making his first start of the year in Beaver Motorsports’ #50 Nisshinbo / Kajima Building & Design Chevrolet. Ogata had struggled through the weekend, spinning in practice and putting up the slowest speed in qualifying at just 163.893mph. When the green flag flew, however, Mike Harmon had an even harder time, missing the start due to mechanical issues. Seconds later, Noah Gragson spun Kyle Busch’s #18 Switch Toyota in Turn 4, collecting Brett Moffitt’s unsponsored #7 Red Horse Racing Toyota. Both Gragson and Moffitt continued, completing repairs inside of five minutes, but Harmon still held last. 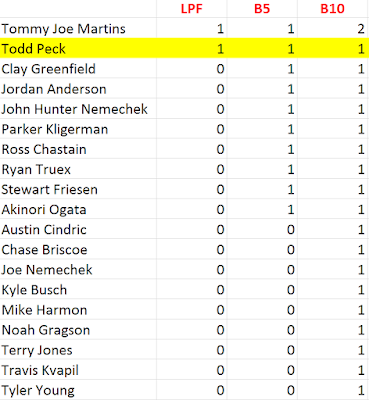 Under caution on Lap 3, Peck pulled behind the wall, and soon became the race’s first retiree. 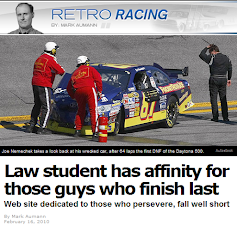 Moments later, Harmon returned to the track and would eventually finish 27th, dropping Peck to last on Lap 5. Gragson and Moffitt recovered nicely to finish 14th and 11th, respectively. Ogata suffered an oil leak and finished 30th. Coming home 31st between Ogata and Peck was Parker Kligerman, whose strong Top 10 run for team owner Charlie Henderson ended on the apron of Turn 1 when the fuel pump failed, stranding his #75 Food Country USA / Frito-Lay Toyota. On the other side of Ogata in 29th was defending Atlanta winner John Hunter Nemechek, who pounded the outside wall just short of the Stage 2 finish. Rounding out the Bottom Five was Jordan Anderson, bumped into a spin by another truck and knocked-out when his splitter dug into the infield grass, nearly overturning his #12. *This marked only the third Truck Series last-place finish for #83 and the first since August 8, 2003, when Willie Green’s Quaker Steak & Lube Ford had ignition trouble on the first lap of the Federated Auto Parts 200 at the Nashville Superspeeedway. The other occurred September 26, 1998, when Joe Gaita’s Building Specialties Ford overheated after 23 laps of the NAPA 250 at Martinsville.